What else will they take away from you? You fought for your country. You fought the good fight. But, now, to get disability benefits, you must fight the VA. You only have one life to live, and if you’re like most veterans, you’ve spent years fighting the Benefits Administration for the benefits that you richly deserve. You selflessly and loyally gave your best years to your country. You proudly defended her honor. You answered her call in her time of need. Yet, when you came back with injuries and diseases from your service, the VA denied your disability claim – not once, not twice, but over and over again. This problem is particularly difficult for those veterans who are unable to work as a result of their disabilities that they incurred in service. Sometimes, you may have a disability rating of 50% or 70%, or perhaps even only 30% or 40%. But, yet, due to your unique circumstances and the unique nature of your disabilities, you’re unable to hold a full-time job. Sometimes, we call it “Total Disability Individual Unemployability,” or “Unemployability,” or “Total Disability,” or simply, “IU.” These are the terms that are often used to describe this type of benefit. It’s very important that you understand this benefit, and there are two things you need to understand. Number one, any time you’re filing an appeal for an increased rating, or from an assigned rating, and the evidence also shows you’re unable to work, this should also raise an implied claim for TDIU. The VA often denies TDIU claims if you do not meet the percentage requirements. Under Title 38 of the Code of Federal Regulations, Section 4.16, the law says that to obtain total disability, you must have a combined rating of 70% with at least one disability rated at 40% by itself. Alternatively, you must have at least one disability rated at 60% by itself. And, these disabilities must prevent you from sustaining a gainful occupation. However, the law does allow for the extra scheduler assignment of TDIU if your unique circumstances demonstrate that you’re unable to work as a result of your Service-connected disabilities. VA does not like to grant these extra scheduler cases, but they do happen. Let me give you an example of a case that we handled for an individual who was able to successfully obtain TDIU despite having a rating of less than 70% combined or 60% for one thing. Our client had a limited education. He did not even attend high school. His only work history involved washing dishes in restaurants and other purely manual labor jobs. He had a severe back disability rated at 40%. He was unable to do any of his former work, and he had no qualifications, training, or education that would give him skills that could be transferred to a sedentary job. We developed his case aggressively with medical reports from his treating doctors, as well as a vocational expert. The vocational expert gave the opinion that, given his limited education and limited work skills, he was unable to sustain a gainful occupation solely as a result of his Service-connected low back condition which was rated at only 40%. We won this veteran’s claim, and he received retroactive benefits of approximately a quarter million dollars. These cases can be won. So, if VA has denied your claim for TDIU or denied your claim for Unemployability because you don’t meet the percentage requirements of the law, then you need to understand that there is hope. The second thing you need to understand about TDIU, or Total Disability Individual Unemployability, is that your unique circumstances, educational and vocational background, are very important to the analysis. What makes one disability totally disabling for one veteran is not going to do the same for a different veteran. Let me give you some examples. I had a client who, in the Service, played in the band. He was a clarinet player. His whole life had been devoted to music, and he fell and injured his dominant hand that he used to play the clarinet, and he developed some sort of necrotic condition, and he lost the use of that hand. He had no other skills beyond music, and he could no longer play the clarinet. As a result, he was successful in obtaining a Total Disability award. However, another veteran whose work history involved something else that did not require the use of dexterity in his dominant hand, may not be totally disabled. Generally speaking, the more limited your education and the more your prior work history consists of manual labor, the more a physical disability will be limiting. However, if you have a white collar or office type work history, a physical disability may not be that disabling. The point I want you to understand is that Total Disability Individual Unemployability cases involve a very specific case-by-case analysis of the veteran’s unique circumstances and background. I know how frustrating this can be. Oftentimes, it is difficult to win these cases without the assistance of a good, highly qualified vocational expert. But, how do you find such experts? How do you know if they’re any good? Only a qualified veterans benefits attorney will know and be able to direct you towards the experts that are needed to ultimately prove your case. Is it Possible to Win a TDIU Claim Once Denied? Yes. If you have Service-connected disabilities that make it impossible for you to work, yet the VA has denied your claim for TDIU, then you need to know that hiring an aggressive veterans disability benefits attorney is one of the best decisions that you could do. Without an attorney, chances are you will be unable to gather the evidence you need to ultimately prove your case. I have helped more veterans than I can count win Total Disability Individual Unemployability benefits. No matter how frustrating it can be, depending on the circumstances of your case, there may be hope. 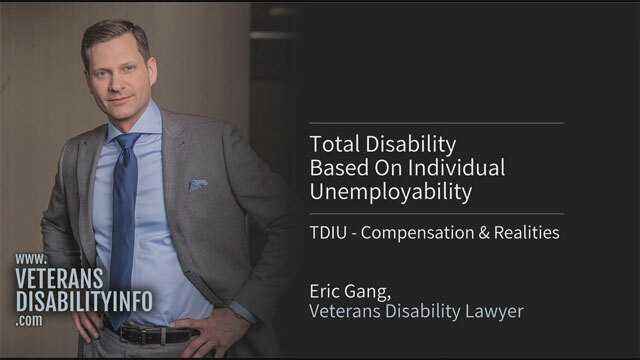 My name is Eric Gang, and I’m a veterans disability benefits attorney, and I have represented veterans all over the world. And, over the last decade alone, I have recovered literally millions of dollars in retroactive benefits on behalf of disabled veterans just like you. In many of those cases, we obtained Total Disability Individual Unemployability, or TDIU, on behalf of our clients who had their claims for TDIU denied. I have won cases that veterans and their Service organization officers have said were unwinnable. We have a track record of hard-hitting, aggressive representation of VA claims. If you, or someone you know, is suffering from Service-connected disabilities that make it impossible for them to work, and the VA is denying their claim for TDIU, then I invite you to contact me. Although our offices are located in the Greater New York City area, we represent veterans worldwide in their claims for TDIU or Total Disability. I’ve represented more veterans than I can count. I’ve helped them win their benefits and collect the money they richly deserve. I know how difficult it can be when you’re waiting for a Total Disability benefits award from the VA. You’re waiting in that time period between leaving your job and waiting for the 100% pay to kick in. I know that you’re struggling right now. You’re wondering how you’re going to make ends meet. And, perhaps you’re scared that you may end up on the streets homeless. You may be worried about your family. And, you’re frustrated at the lengthy delays at every step of the process. One of the best things you can do is hire an aggressive veterans disability benefits attorney who can represent you in a claim for TDIU. You’ve come a long way, and you deserve justice. You deserve vindication. And, you should be recognized for your sacrifice in what you’ve done for our country. You gave up everything – your youth, your strength, your life. And, now, it’s time for you to win your VA benefits. I invite you to call me. I’m here to listen.